The machine-learning technique known as deep learning, which has shown impressive results in voice and image recognition, has been adopted by the leading bioinformatics company focusing on cancer and aging as part of its DeepPharma platform. A machine-learning technique which borrows some of its principles from the brain and gives computers the ability to recognize speech and categorize images is also being utilized in the ongoing fight against cancer and other age-related diseases. Insilico Medicine, a bioinformatics company dedicated to drug discovery for cancer and aging, has launched its proprietary DeepPharma (TM) platform. DeepPharma utilizes the latest advances in deep learning to improve computer analysis of massive multi-omics data and millions of tissue-specific pathway activation profiles obtained using proprietary methods developed by the company. Insilico's DeepPharma platform leverages the power of NVIDIA GPU accelerators, the leading computing technology for the training of deep neural networks. NVIDIA GPU technologies have been widely used to accelerate scientific, analytics, engineering, consumer, and enterprise applications, including research in drug discovery. "Using NVIDIA GPU technology, our DeepPharma platform allows us to apply deep learning techniques to our multi-omics intracellular signaling analysis in both personalized medicine and drug repurposing,” said Alex Zhavoronkov, PhD, CEO of Insilico Medicine. Dr. Zhavoronkov plans to integrate deep learning platform for drug discovery with each of Insilico’s R&D teams. Insilico has teams of researchers in Russia, the United Kingdom, Switzerland, Poland, and the US, with R&D collaborations in Canada, Israel, Switzerland, and China. While deep neural net concepts were proposed decades ago, the revolution in the use of the technique started around 2010 when deep learning systems were trained on large image datasets achieving almost human image recognition and later surpassing humans. The technique is rapidly transforming the way we work with images, text, videos and voice. However, application to genomics and drug discovery is much slower, since it requires massive data bases required to train the system and special configuration enabling the algorithms to work with multi-omics and patient data. 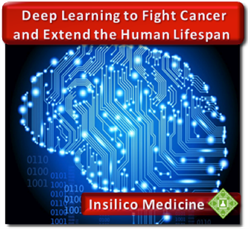 Insilico Medicine developed methods to massively augment its proprietary gene expression and proteomic data using public databases, methods to normalize data and turn it into usable pathway activation profiles that can be used by deep learning algorithms. It also developed methods to process clinical trials and large amounts of research publications. These methods are now integrated into the DeepPharma platform powered by one of the most advanced GPU-based platforms. Together with Novartis Insilico Medicine is organizing the Aging Forum at the Basel Life Science Week (September 21-24th), where it will present its deep learning technology for classifying signaling pathways involved in aging and age-related diseases. Please visit http://www.Basel-Life-Science-Week.eu for more information. Next month, the company plans to fuel its growth by hiring more data scientists at the first-ever deep learning “neuro hackathon." "The hackathon will focus on deep learning to identify brilliant individuals and teams interested in transforming the pharmaceutical industry,” said Zhavoronkov. InSilico Medicine, Inc. is a Baltimore-based company utilizing advances in genomics and big data analysis for in-silico drug discovery and drug repurposing targeting aging and age-related diseases. The company utilizes the GeroScope™, OncoFinder™ , Pathway Cloud Intelligence™ and PharmAtlas™ packages for aging and cancer research, pursues internal drug discovery programs, and provides services to pharmaceutical companies.